We will help you discover ways your family can make healthier choices about food, eating behaviors, and activity and support you on your journey to a healthier lifestyle. 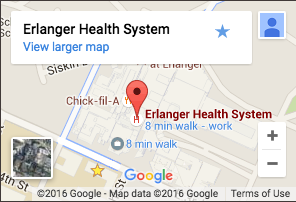 The HEAL Clinic is located at Children’s Hospital at Erlanger. From the main lobby of Children’s Hospital, take Elevator K to the ground floor. When you exit the elevator, turn left. Stop at the first waiting area on your right, labeled “Children’s Nephrology/Hypertension.” Check in here for your appointment. If for any reason you need to reschedule or cancel your appointment, please call 423-778-5767. Like us on Facebook to stay updated about healthy eating and active living events in Chattanooga and the surrounding area. Go to www.facebook.com/CHEALCenter. We'd love to hear from you, too! Please visit our Resources tab for links to healthy living resources and websites for families.